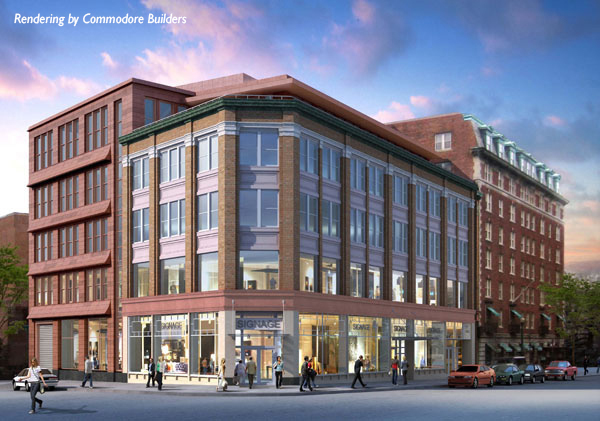 Commodore Builders has generously offered to provide BAC students with a tour of the 375 Newbury Street Project, located at the corner of Massachusetts Ave and Newbury Street. This 4-story, 40,000 square-foot masonry building dates back to the early 1900s and has been home to various restaurants and retail stores on the ground floor. The renovation of the property will include a complete replacement of the façade, including the decorative storefront detail. The existing structure will also be expanded with a new steel-framed 4-story addition that will extend the Newbury Street elevation with an in-fill. The renovation prepares the base building for the next phase of the project, which is the tenant fit-out. The tour will take place on Friday, March 14 at 10:00am. Students will meet outside the entrance of the construction site. Space is limited; interested students must RSVP to practice@the-bac.edu no later than Wednesday, March 12 so that Commodore can set aside hard hats, safety glasses, etc. This is a construction site; be sure to wear the appropriate boots and clothing.